The hike is about 2.5 miles loop starting at the Condor Trail to the Volvon Trail and then back using the Blue Oak trail. This place has Sandstone hills within the park's 4,708 acres which are adorned in spring with more than 90 species of wildflowers, including the Diablo sunflower (Helianthella castanea), which grows only in the foothills of Mount Diablo. 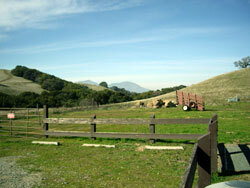 Deer, coyote and even the elusive mountain lion may be seen here, and a variety of raptors frequently soar overhead. Dress for the weather. Carry lots of water and light snacks. Elder scouts can have the option to do an additional 1.2 miles to complete a bigger loop. Questions? Contact Hiking Chair, Sid at 408 431 8037.